Prepare for and respond to public health emergencies. I encourage you to browse this web site to get more information about the programs and services that we provide. We have a dedicated staff of public health and administrative professionals who are committed to enhancing the health of the Albany County community. Our programs affect everyone who lives in our neighborhoods, eats in our restaurants, works, plays, or even visits us in Albany County! Please call upon our department if we can provide additional information or be of assistance to you. Addiction can happen to anyone at any time. 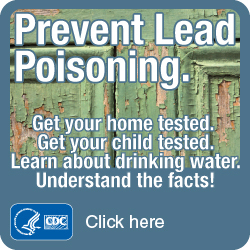 Prevent Lead Poisoning. Get the facts! The Albany County Department of Health Annual Program & Services Report highlights the exemplary and dedicated work of our staff, the challenges we faced, and the many successes we accomplished throughout the previous calendar year.